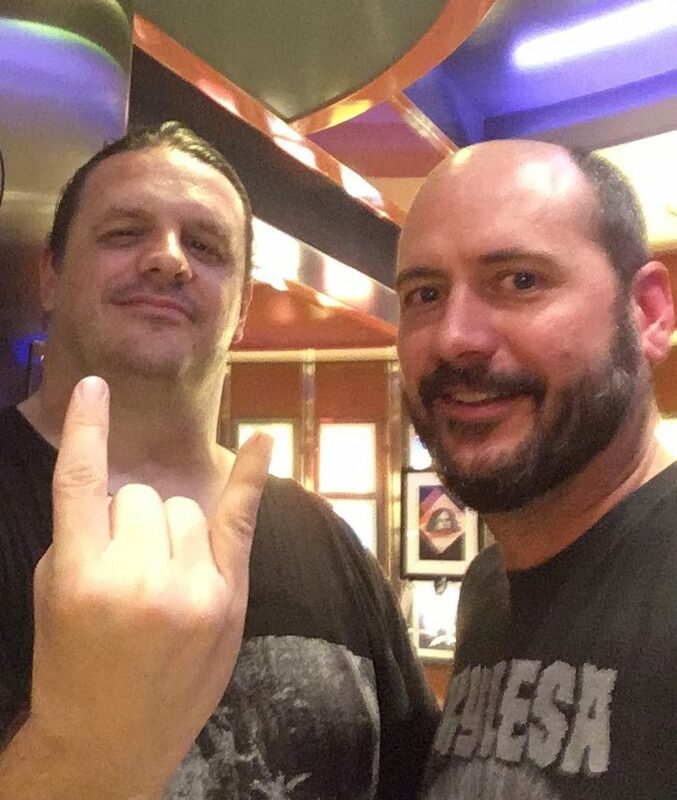 It has been a mere four months since the 2018 70,000 Tons of Metal cruise, and, quite honestly, we haven’t been “complete” since stepping off the Independence of the Seas and saying good-bye to friends, new and old. Now it is a waiting game. We know the dates for next year’s cruise and we are currently making plans. We know we will reunite with many of our metal bretheren, but the lineup is still forthcoming, and we are waiting … patiently. So while daydreaming, we thought we would share five things that have been missing from our lives since February’s cruise to Grand Turk and back. 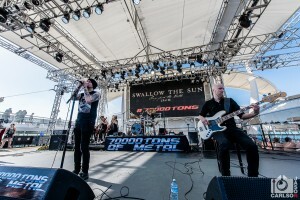 With three sets over the course of the four-day cruise, Swallow the Sun performed their Songs from the North I, II & III in its entirety. It was a truly impressive series of performances that left audiences enthralled. 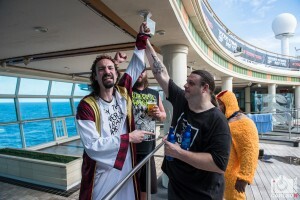 Meeting, interviewing, and getting to know frontman Mikko Kotamäki only enhanced the experience, but this is what happens on this cruise. The barriers are broken down between audiences and bands, and metal heads from around the world are immersed in the music and the experience. It is otherworldy. The crowdsurfing Jesus truly knows this. Ace Ventura, who moshed to Cannibal Corpse, was reveling in the freedom. And the chicken? Let’s just say that no one cares. Ready for a nap after a long night of partying? Find a comfortable sofa in the pavilion or a chair in the shade on the top deck. Me? I like daydrinking … which includes drinking in the morning, in the afternoon, in the evening, and until I go to bed. And there is no judgment. I recently took the liberty of engaging this hobby of mine at a elementary school spring fair, and it didn’t go over so well. I miss the boat! Just between us, I am bald and tattooed, so sunscreen is a part of daily life for me, whether it’s summer or winter, rain or shine. It took me a day to realize what was going on, but when I confirmed that the Pool Girls would spray you down with sunblock for free, I was a happy man. And I didn’t get sunburnt. This is just one of the perks while being pampered on the cruise. (There is plenty more pampering available, but for this guy, a metal show, beer, and plenty of sunscreen will suffice.) Next year, as well, the Independence of the Seas will boast a number of upgrades which will surely excite some. Waking up groggy, hung-over, and stumbling into see Necrophobic at 11 a.m. on a Friday morning was a little like culture shock. It was startling at first, but after the first beer, things started to make sense. Satanic death metal? Check! On a boat? Check! Day-drinking? Of course! It doesn’t get any better. The music begings at 10 a.m. and runs until the wee hours of the morning. With four stages, ranging from a cozy club setting to two theaters to an outdoor arena, you can have a variety of performane experiences, particularly since each band plays twice. It can be a challenge getting from one stage to the next in time to catch a full-set, so scheduling through blurry eyes and mushy brains is critical (and critically over-rated). There are plenty of ways to keep on track, though, from printed schedules delivered each morning to cell phones. We all know that metal is a tribe. We are weird, we are agressive, we are human, and we have a lot in common. That is what comes quickly to the surface while on 70,000 Tons of Metal. Sharing a seat with new friends for breakfast is the norm, headbanging by the hot tub with metal loyalty is expected, and sharing an incredible experience that bridges nationalities is pure magic. 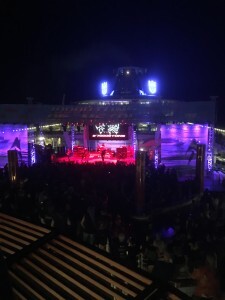 The 2019 70,000 Tons of Metal cruise will set sail from Ft. Lauderdale, Florida, on January 31 and will trek to Labadee, Haiti, and back on the refurbished Independance of the Seas. While details are forthcoming, we are ready. Are you? Keep your eyes 70000tons.com for details, and make sure you are saving your money. You won’t want to miss this!